An orange-dressed, hard-hatted man is playing a harmonica as it rains. Suddenly, the alarm sounds on the Ressha and Conductor alerts the ToQgers to the approaching Kuliner that slams into them. Hikari suggests they all go to their respective Resshas. 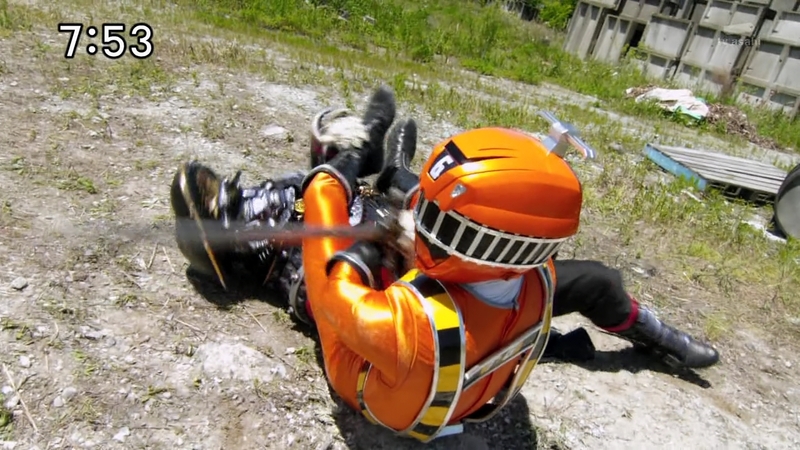 The ToQgers get knocked around the trains as the Kuliner continues bumping into them. Tokacchi sees the AppliChanger on the floor after the box falls, but Mio tells him to think about it later. They quickly combine into ToQ-Oh, but Right suddenly senses Zett who seems to be reaching out from the Kuliner into ToQ-Oh. 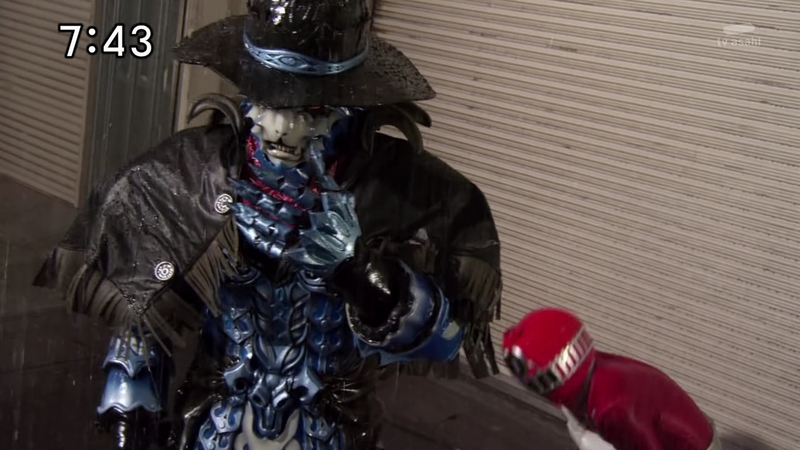 A wave of darkness pushes ToQ-Oh back and Right summons Gramps-tachi. 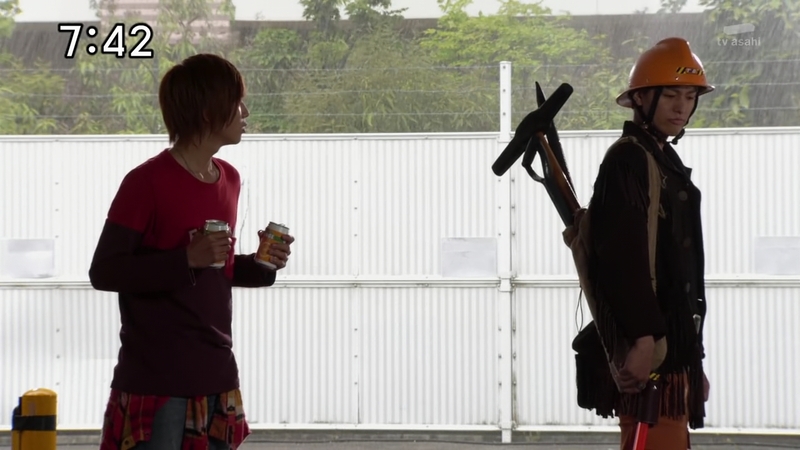 The ToQgers use both ToQ-Oh and Diesel-Oh to defeat the Kuliner. Does that mean the Emperor is also defeated, Tokacchi asks. But Right says he doesn’t think the Emperor was on board. Indeed, Zett is on his throne at the castle. Back on the Resshas, Conductor announces that they will be stopping for a little bit so the tracks can be inspected for any possible damage. Also, he and Ticket ask if anyone has seen a smartphone about. Tokacchi hands Conductor the AppliChanger and he and Ticket tell them it is a new henshin device for the sixth ToQger. 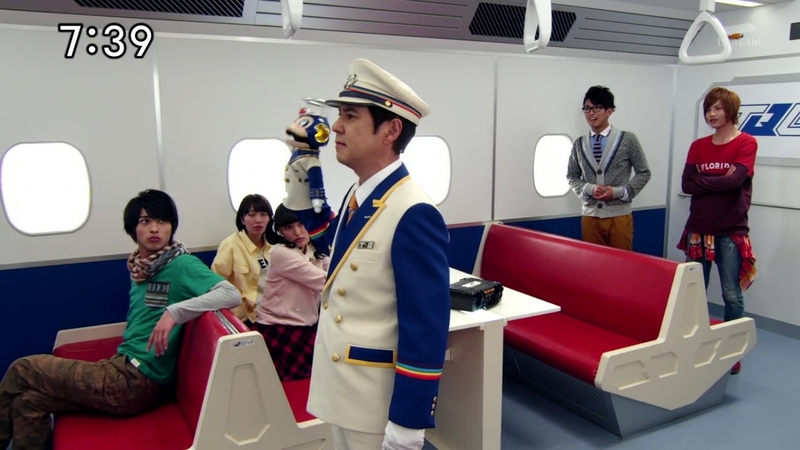 Wagon thinks she is the sixth ToQger, but Conductor says that’s crazy. Besides, someone’s already been chosen. He turns a spotlight, literally, on himself. But they suddenly hear a harmonica. They all peek out the window and see the orange-dressed, hard-hatted man walking down the train tracks in the rain, playing his harmonica. 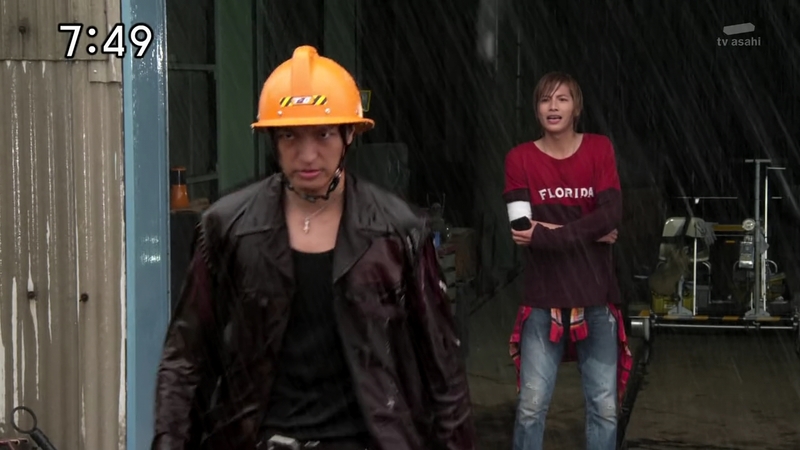 They assume he is the sixth ToQger and think he seems very cool, walking down like that with the rain apparently only pouring down on him. He’s just a railway worker, Ticket says. Conductor adds that he’s just here to inspect for possible damage from the battle. 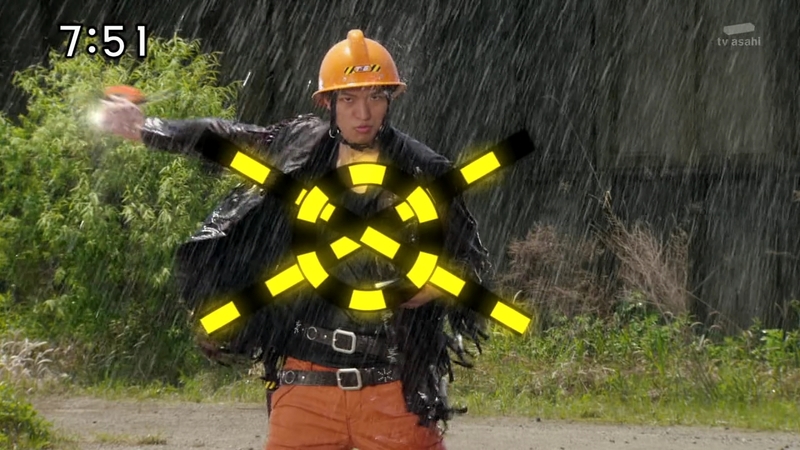 Right still thinks he could be the 6th ToQger. But Conductor and Ticket insist no. To be honest, Conductor and Ticket tell them that this man used to be a Shadow. Over at the Castle, Baron Nero is very excited to see the Emperor is finally trying to crush the Rainbow Line like a true Emperor of Darkness. Madame Noir knocks him out of the way to ask to take Zett’s measurements for his wedding clothes. Nero and Noir start arguing until Zett sends a wave that knocks them to the floor. “You idiots really don’t get it!” Zett tells Nero that he’s only interested in shiny things and tells Noir that her shiny sparkle is fake and that the only kira-kira in this Castle is Glitter’s eyes. Baron Nero speaks up. But why? He is a part of the darkness like they are. When did he become so obsessed with shiny things? Glitter wonders what is wrong and thinks he seems lonely while Schwarz wonders just exactly what the Emperor wants. But as long as the Emperor is preoccupied with shiny things, Schwarz can do what he wants. A Kuro comes and whispers something to him. Schwarz can’t believe that “he” is still alive! 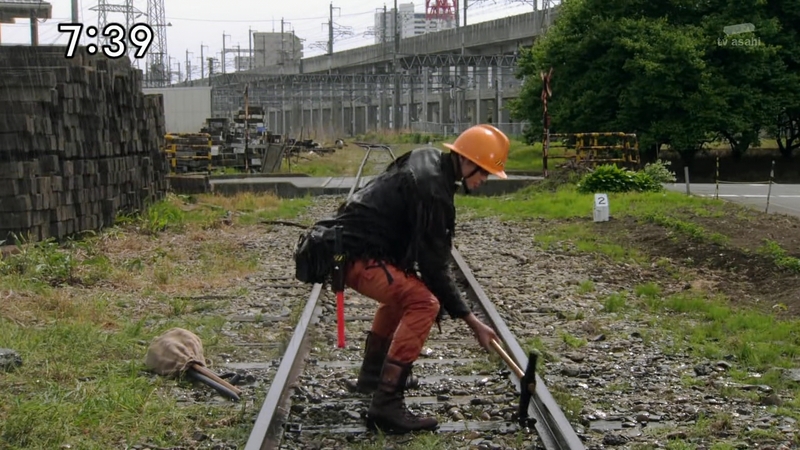 The orange railway worker tightens and checks the bolts on the train tracks as Conductor tells the ToQgers what he knows. He doesn’t remember when, but he knows that this former Shadow had a change of heart and was given permission to work on the Rainbow Line as he wants to atone for his sins. Besides, they shouldn’t trust a former enemy so easily. Hikari agrees. But Right doesn’t. If this guy is no longer a Shadow, then he is no longer their enemy. The worker finishes his inspection and waves the Resshas off. But when he turns to walk back to the warehouse, there’s Right, happily waving to him. Right chases after the worker who hides. He thinks he’s lost Right, but then there he is with a pair of orange sodas. “What do you want from me?” he asks. Right says he just wanted to thank him for taking care of the train tracks for them. 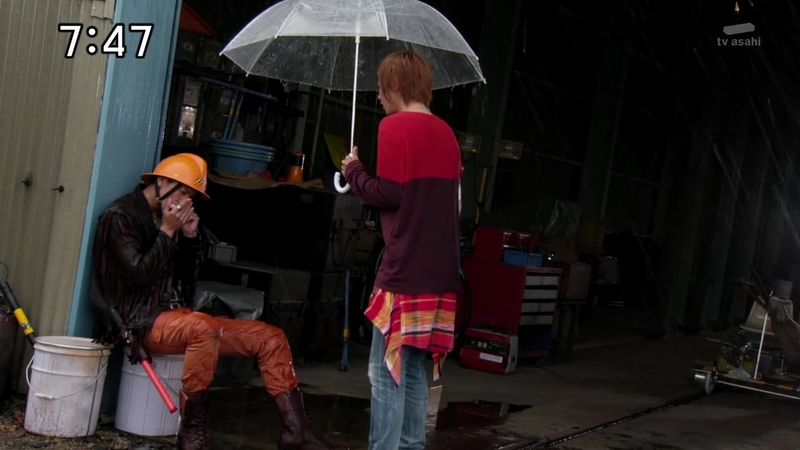 The worker hands the soda back to Right and says he isn’t someone the ToQgers should be thanking. Just then, Schwarz walks in. “I’ve given up that name,” Zaram says. Schwarz says he’s surprised to find Zaram on the Rainbow Line after leaving the Shadow Line. Why!? “You wouldn’t understand if I told you,” he replies. Schwarz charges forward and Right quickly henshins. But Zaram tells him to stay out of it. Right will not. Schwarz knocks Zaram over and takes on Right whom he says has improved. But Zaram runs over and as he engages with Schwarz, he turns into his Shadow form. The rain turns into a torrential downpour for a few seconds, long enough for Zaram to whisk Right away. He bandages Right’s arm and begins to explain. 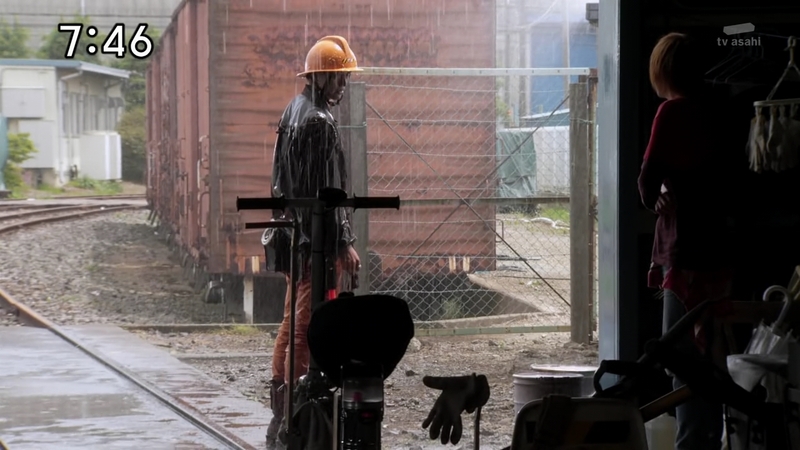 He’s long given up being a Shadow, yet this power of controlling the rain stays with him. Having expected something more bleak, Right tries to comfort Zaram, but he says he knows the weight of his sins. One day, he saw a rainbow in the sky. It was the first time he thought something was beautiful and that’s when he decided never to create darkness to cover it up again. That’s why he’s left the Shadow Line. The others are off the Ressha and looking for Right, but they instead come face to face with Schwarz. 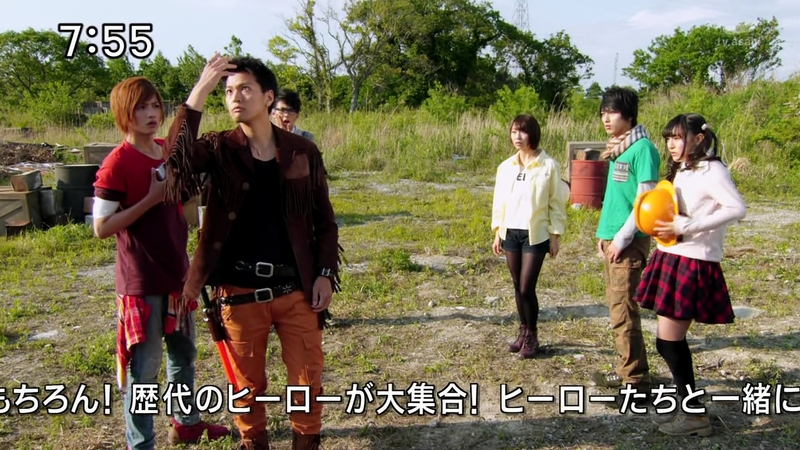 Schwarz asks where they are hiding Zaram and of course the ToQgers have no idea what he’s talking about. Tokacchi calls Conductor to report and he knows what to do. Wagon’s selfie time is interrupted when Conductor and Ticket enter the main car. They henshin… or, just Ticket henshins. 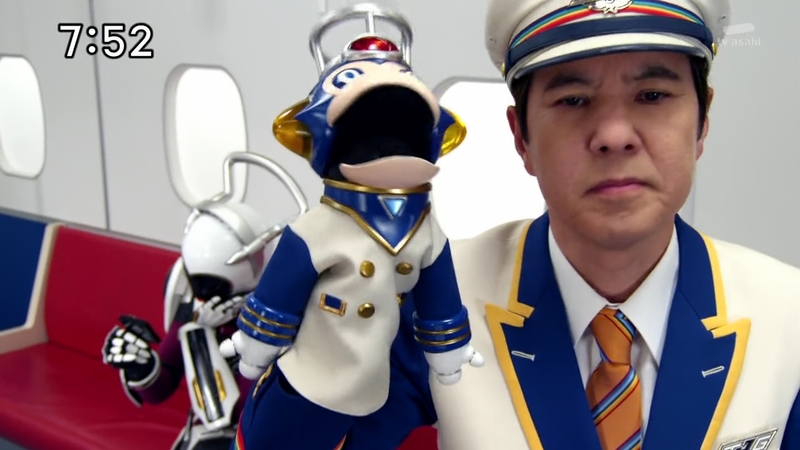 He’s ready to go and he pulls Conductor along, but Conductor doesn’t want to leave the Ressha unarmed and unsuited. Wagon decides to call Right. 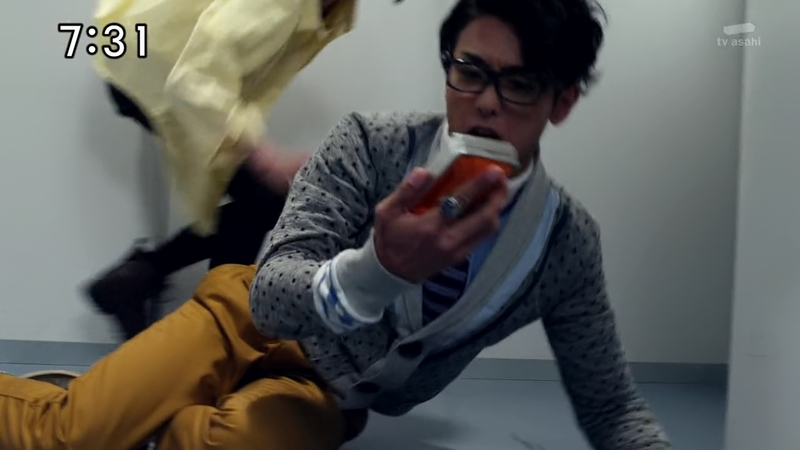 Schwarz is tossing the other ToQgers around when they suddenly hear the harmonica. Zaram walks towards them, rain pouring down on him. He flashes back to Right’s pep talk. Right knows Zaram can see in his mind exactly what he wants to do. 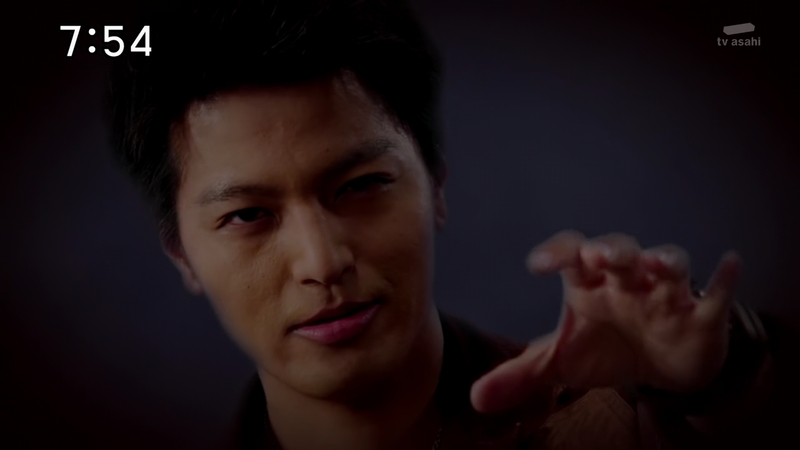 That’s why Right thinks Zaram is perfect to work with them as the 6th ToQger. Zaram has the AppliChanger and the Build Ressha. Right arrives and tells the others that starting today, Zaram is their new comrade. Zaram takes the AppliChanger and Ressha and henshins into ToQ-6. So you have truly left the Shadow, Schwarz says. 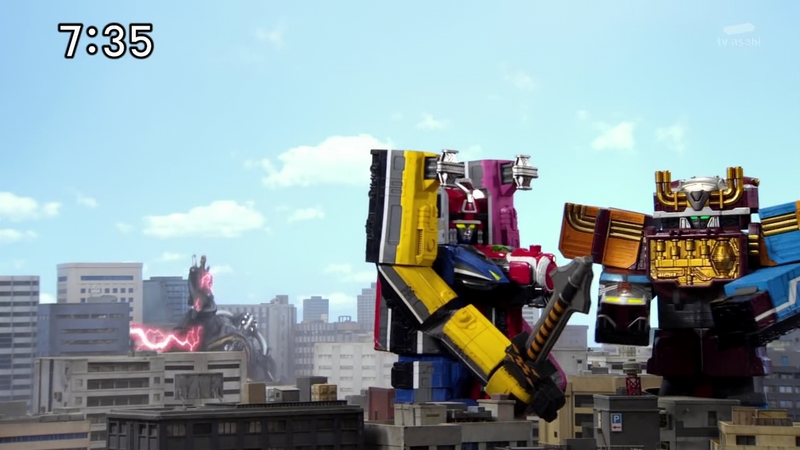 Zaram picks up his Yudo Breaker and uses a Drill Ressha to deliver a final blow to Schwarz as the others watch. HUGE explosion and both Zaram and Schwarz are still in-tact. 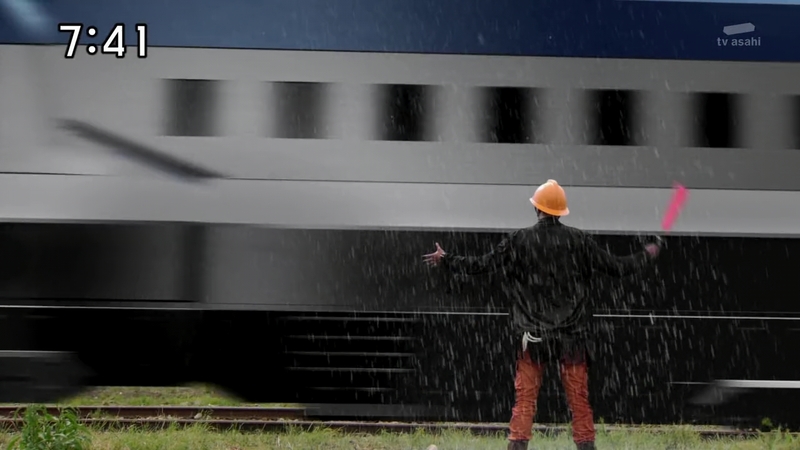 “Zaram.. that train…” Schwarz hops onto his Kuliner. “I have no regrets,” Zaram says as he collapses. 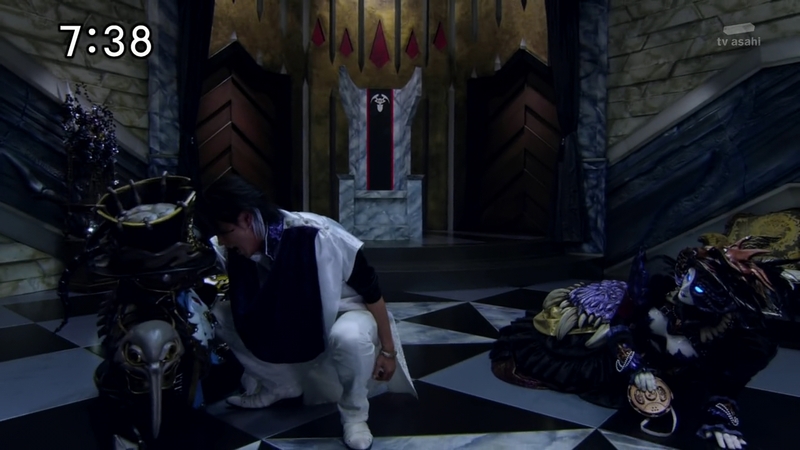 The other ToQgers run over to him as he now finds himself in a white place. 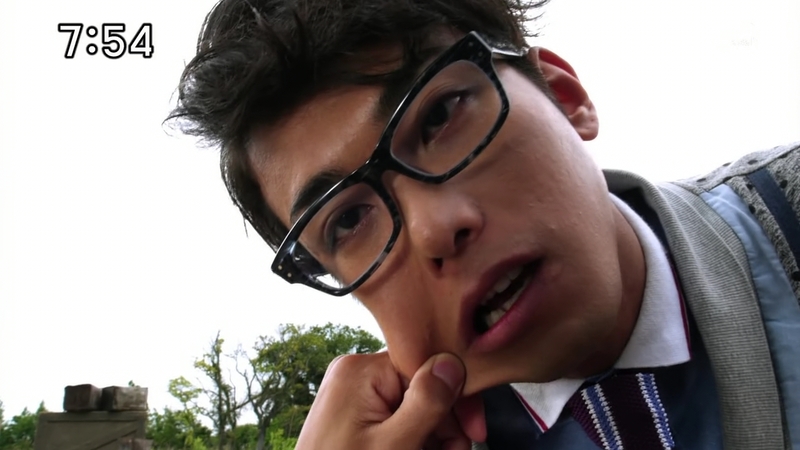 But actually, he’s still in this world as he’s pinching Tokacchi’s cheek. 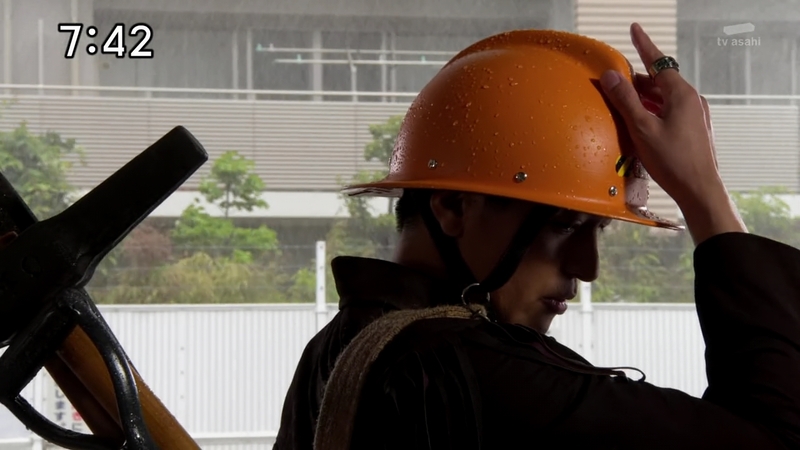 Zaram gets up and hands Right the AppliChanger and Build Ressha back. He motions to tip his hard hat, but it’s gone. Kagura hands it over. Right calls over to him, but Hikari says ignore him for now because he needs to explain himself. 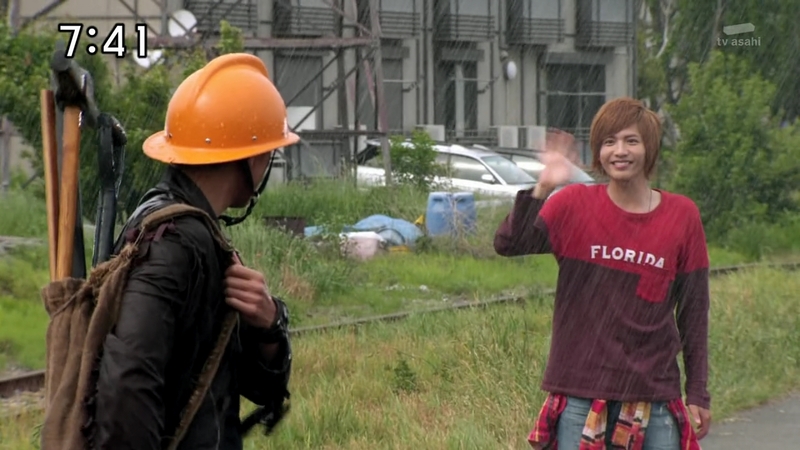 It was a pretty good introduction to our new ToQger. Zaram (not yet Akira) definitely adds a lot of story possibility. 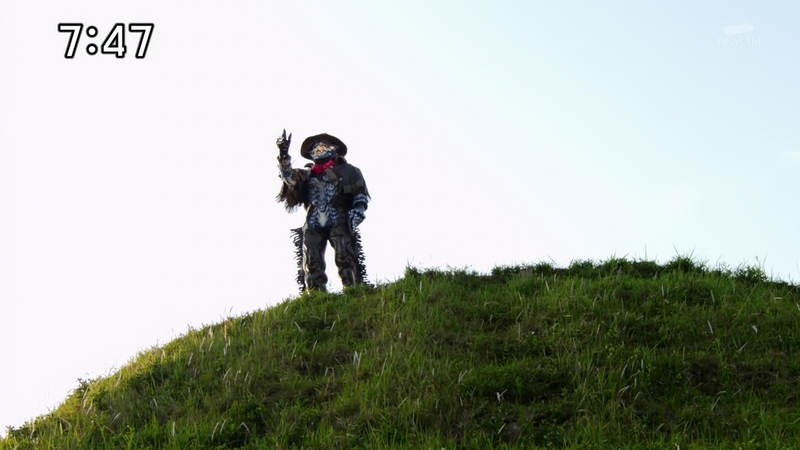 The season is centered around the ToQger’s friendship and bond, so having this outsider now be part of the team definitely adds another element to the team dynamic. As does the fact that he’s a former Shadow. It’ll also be interesting to see just how far his and Schwarz’s plan and maybe friendship went back before he tasted the rainbow. But most interesting maybe his intense guilt for raining on everyone’s parade, like literally. He never killed anyone, like Right may have assumed, but that he is so upset over causing sports cancellations and inside recess is both hilarious and very sad. Zett’s fascination with shiny things also continues to be very intriguing. Just what turned him on to the light. Could it be as simple as Zaram tasting the rainbow or is there something bigger, something that involves Right perhaps? Seeing Ticket henshin was awesome. 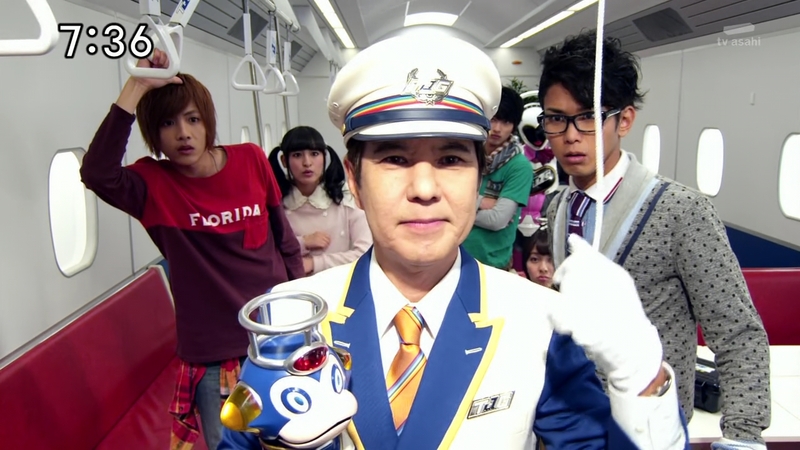 I’d love to see Conductor, Ticket and Wagon all become official ToQgers in the future. Or at the very least, see them fighting and in battle as well. I still don’t get the hate for ToQger that people seem to have. Or even the indifference. 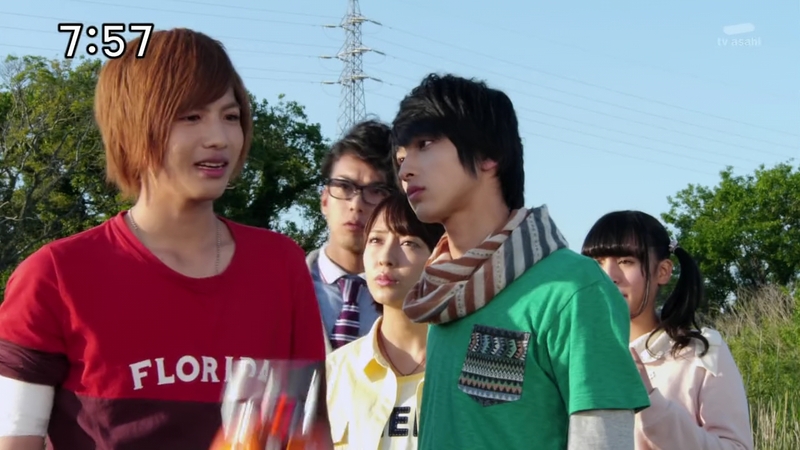 This season has moved at a great pace and I think even has moved faster than Gaim did in their first 17 episodes. We’ve been learning more and more about everyone, both our heroes and the villains, and of course, things have been very fun along the way. I personally was cracking up when Zaram revealed his ‘tragic’ backstory. It’s a shame though that his Shadow form looks so cool since he probably won’t be using it much during the series. lol I agree on both! I have definitely loved the designs for the Shadow Line.